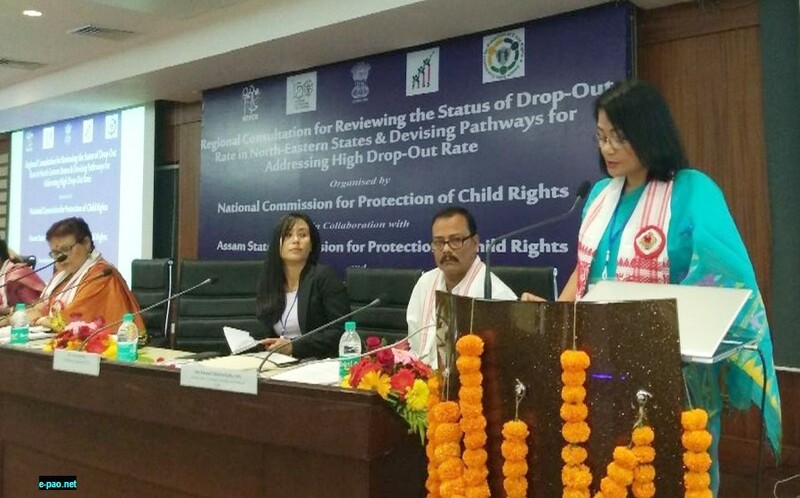 During the inaugural session of the NE Regional Consultation programme dated 25th March, 2019 and sponsored by National Commission for Protection of Child Rights (NCPCR) at Guwahati, Sumatibala Ningthoujam, Chairperson of MCPCR has highlighted the critical issues of school drop-out in Manipur. She said that as per the recent report given by NITI Aayog the drop-out rate at upper primary level is comparatively higher in North-Eastern States. Addressing the issue of quality education, NITI Aayog has recommended spending at least 6% of GDP on Education as a whole. In the report the Advisory Body has also highlighted that India’s spending 3% of GDP on education is lesser then the world’s average 4.7% of GDP. In Manipur there is an ever increasing preference for private schools over govt. schools. This is perhaps due to the general perception that Private Schools deliver better quality education then govt. schools. Also it needs to be emphasized that in spite of govt’s efforts to improve the quality of education, it utterly fails due to the inadequate public funding in education sector. Also as per the provisions of RTE Act, 2009 students are promoted to their respective next higher classes generating a good reason for drop-outs latter. In context of Manipur there are many other factors contributing to drop-outs for school children. 4) Poor children are usually compelled to go for petty jobs instead of going to schools etc. a) Stakeholders should have to be made accountable to drop-outs. c) Actionable SDIMS (Student Database Information Management System) software should be effectively implemented.